If you are reading this, then you are likely to besuffering from sensitive or receding gums and want to know what is the best electric toothbrush you can use to help resolve or improve your situation. Well, let me get straight to the point, there is no one perfect brush for the job. Yes, you read that right. The market is awash with products that can do the same/very similar things and to honestly tell you there is one solution is just not possible. However, from the wide array of choice there are some excellent options, which we run through and explain below. For even more detail and explanation, you may like to check out the buyer’s guide that we include later in the article. 3 of the 5 recommendations below are Oral-B models. This is because Oral-B use smaller rounder heads that oscillate and rotate compared to the sonic motion of Sonicare brushes from Philips. The Cochrane group, which has carried out clinical research, discovered that the best results came from those smaller oscillating toothbrush heads Oral-B offer. That being said, Sonicare is really not far behind and still offers some great options. The Pro 3000 is my top pick because it offers the essential features and at a price point that most find more than acceptable. The Pro 3000 has all of these and more. Offering 3 cleaning modes in total (Daily Clean, Gum Care and Sensitive), 2 are optimised to treat the symptoms discussed. Gum Care is suitable for sore or inflamed and even bleeding gums. It offers a gentle massage of gums to stimulate blood flow and strengthen and nurture the gum tissue. This mode operates at 2,600-8,800 oscillations and 12,000-40,000 pulsations, whilst Sensitive operates at 6,500 oscillations and 30,000 pulsations. In the box with the 3000 are 2 brush heads, a more standard CrossAction but also a Sensitive brush head, which means you have the softer bristled option available out of the box ready to use. On the neck of the brush handle, at the rear is a red coloured panel under which sits an LED. This is the pressure sensor. If too much pressure is applied when brushing, this will illuminate as an indicator to you to relieve this pressure. The brush motor will also reduce the amount of power delivered until the pressure is relieved. There is the 2 minute timer, with 30 second pacer too. Slight pauses in the brush head motor and subsequent change in sound are what alert you to the need to change quadrant or end the clean. The toothbrush features a slim handle, which is easy to grip and use thanks to the rubber grip down the front. It offers a 7 day/28 minutes usage time. A small plastic mould clips round the charging stand to allow the 2 brush heads to sit upright when not in use. The RRP is around £99 but generally it can be purchased at significantly less. Considering it also comes with a 3 year warranty (when registered online) that is pretty good. Read our Pro 3000 review. 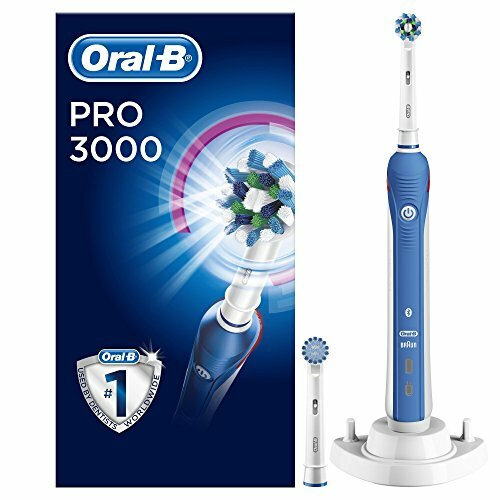 The Smart 4 4000 is the next model up in the Oral-B range of electric toothbrushes from our top pick the Pro 3000. Offering a Clean, Gum Care and Sensitive mode it has the options for a softer or more invigorating clean. What makes it quite clever is the Bluetooth technology that is built-in. 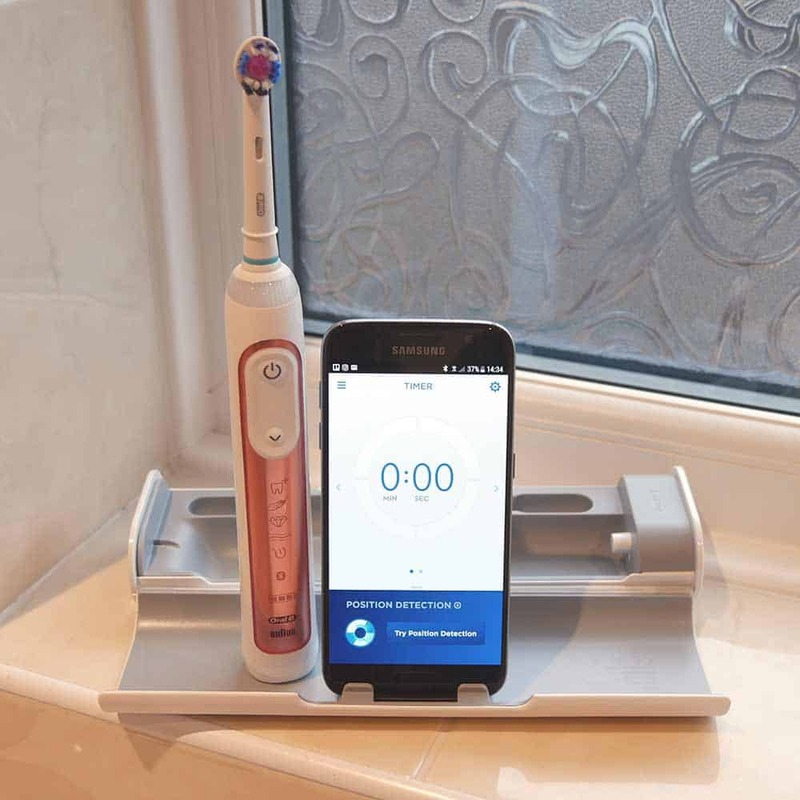 Using the wireless technology, on your smartphone screen you get a timer, alerts and assistance on where to brush in the mouth to achieve a good overall clean. The app then logs each clean in a calendar so you can over time build up a history and a log of what you have done and how your cleans have improved. Tips and information are provided and it can be a useful tool in educating you to become better at looking after your teeth. You don’t need your smartphone with you all the time as the brush itself will retain data of up to 20 cleans and sync this with your phone next time it is paired. You spend a little extra on this brush but for some it might be worth it. The RRP is around £130 but generally it can be purchased at significantly less, typically £60. Read our Smart 4 4000 Review. 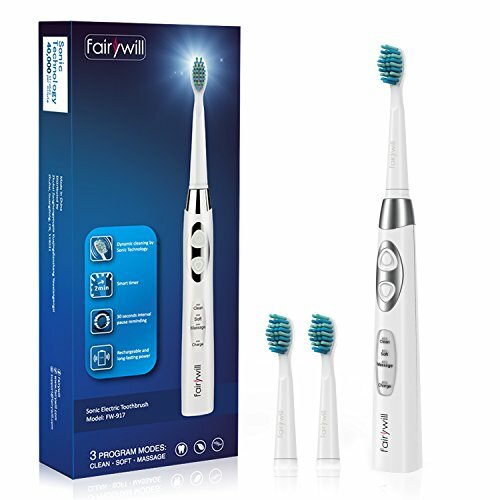 Fairywill might not be a brand of toothbrush you have heard of before and that is because they are a relatively new brand. Chinese in origin, their brushes offer exceptional value for money and certainly feel like they clean as well. They might not have the reputation of the Oral-B and Colgate’s but they soon will when you consider what you get here. For what is at least half the price of all the other brushes in the list here, the Fairywill FW-917 offers a month battery life, 3 brush heads in the box and 3 cleaning modes, including a massage and soft. Now we get serious in terms of what is on offer. 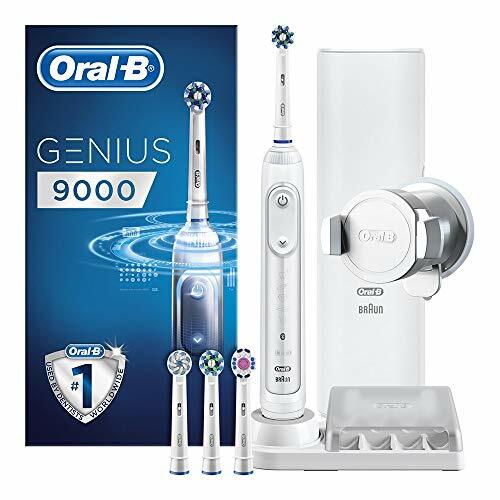 The Genius 9000 (view on Amazon) is Oral-B’s current flagship electric toothbrush. For some it might be overkill, but it has all the Pro 3000 and the SmartSeries 4000 I spoke about earlier and more. Extra cleaning modes, better battery life, a premium travel case and even enhanced position detection using the smartphone app available for iOS and Android. 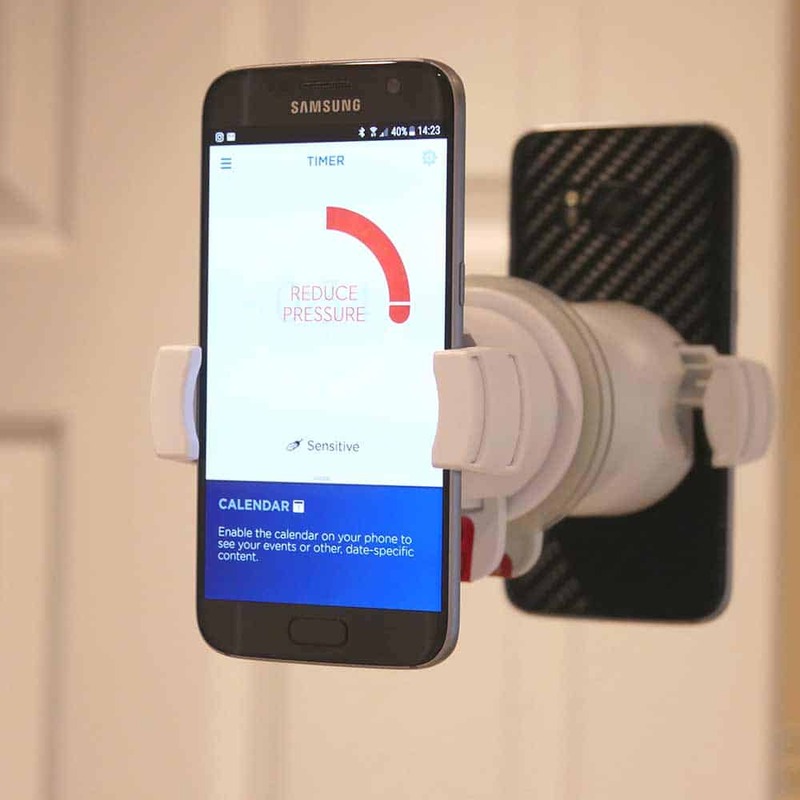 Additional brush heads come in the box and you even get a smartphone suction cup mount to attach to a wall or mirror in your bathroom. This brush is for those who want to invest and will likely share with a partner or other family members. 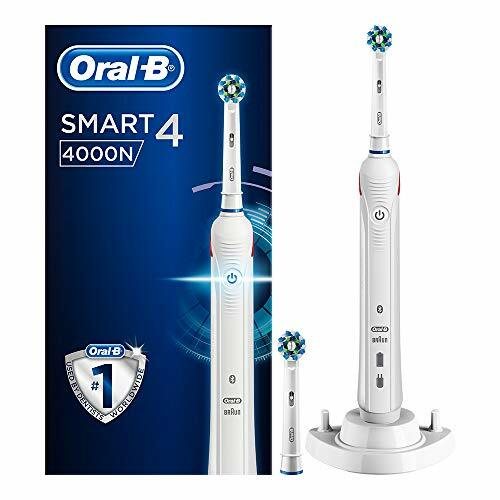 Offering up to 12 days of battery life, it still falls short of the Philips Sonicare alternative, but it is better than the Pro and SmartSeries. It is a little bulkier in hand to hold, but not cumbersome. The enhanced tracking uses your smartphones front facing camera and sensors in the brush handle to detect where and how you are brushing. It then provides feedback and advice on where and how to clean better. It is a bit like having a dentist looking over your shoulder! Read our Genius 9000 Review. The DiamondClean (view on Amazon) is Sonicare’s equivalent to the Genius 9000 in many respects only without the Bluetooth connectivity and the pressure sensor. What it lacks in apps and core functions it makes up for in battery life and design. A slick and stylish brush this looks the part, available in an array of colours it comes with one of the best travel cases I have seen and a smart charging glass. Sensitive and Gum Care cleaning modes are provided, but no Sensitive brush head, this is an optional extra. It comes with the newer AdaptiveClean head which is good but not quite ideal in my opinion. With Sonicare you pay a bit more to get a bit less in some respects when you compare it to Oral-B. However, a 3 week battery life, automatic power off at the end of the cleaning cycle and a fantastic build quality, there is something reassuring about the DiamondClean that you only appreciate when you are using it. Understandably you want more information, so continue reading this article for a comprehensive explanation as to what to look for when choosing an electric toothbrush and why we have made the above suggestions. Whilst sensitive gums are technically different to a condition known as receding gums, they are often closely linked. Sensitive gums are sore gums, and can be a sign of gum disease. Untreated disease will often result in gum recession. You see, your gums act like a natural seal around your teeth. A bit like how a plug acts as a seal in a plug hole, stopping water escaping down the drain. The gum covers all of the bone that holds the tooth in place. Normally this gum is around 2-3mm deep all the way around the tooth. In ideal circumstances your gums should be a nice healthy looking light pink colour with a slightly dimpled appearance (similar to orange peel). Gingivitis is another word for gum disease, and it is caused by bacterial infection in the gingival sulcus. Where your gum meets the tooth it creates a small pocket between the top of the gum the top of the bone holding the tooth in place, and the tooth itself. This pocket is called the gingival sulcus and gingivitis is caused when food particles and plaque get caught here. This is the early stages of a condition called gingivitis, or as it might more commonly known, gum disease, also known as periodontal disease. At the initial stages of gingivitis the gums are often sore and sensitive to the touch, particularly when brushing. Sensitive teeth may be caused by a number of issues. The two most common causes of sensitive are tooth decay and tooth wear. If you have a poor oral healthcare regime, the sugars in your food are used by the plaque to produce acids that eat away at the tooth enamel. Continued attacks cause the enamel to break down – tooth decay, eventually resulting in a cavity (or hole) in the tooth surface. This exposes the softer internal part of your tooth, a substance called dentine. Once this dentine has been exposed, the nerve of the tooth is more vulnerable to changes in temperature or acidity, which is why you can get pain. Tooth wear is also caused by exposing the dentine, but the way that this is caused is different. In tooth wear, rather than poor oral healthcare, the dentine is exposed by too many acids, brushing too hard, or grinding your teeth. Fluid filled tubes run through the dentine and connects to the nerve. Eating or drinking foods that are hot, cold, sweet or sour can change the fluid movement. The nerve responds with that ‘pain’ you might be familiar with. Even those with perfectly healthy teeth will at times get tooth sensitivity, but it is magnified in cases where there is a physical hole in the tooth surface. Receding gums (also known as gingival recession) is when the gum lowers its position on the tooth, revealing or exposing the root of the tooth, once protected by the gum. The bit of the tooth that is exposed is the dentine, and again this can cause sensitivity in the tooth. The gum itself may be sore if you have gum disease because of the bacterial build up. Whilst strictly different from a dentistry/medical viewpoint, gum recession can be brought on by the advanced stages of periodontal disease, hence the link between sensitive and receding gums. However, both can also be brought on by a number of other factors too. Treatments for recession depend on the cause, but no matter what stage you are at, there are treatments available. Poor nutrition – Good health is fuelled by good foods. A lack of Vitamin C is particularly problematic for the mouth. Smoking – Such a habit means you will likely collect more tartar on the teeth and have deeper gaps along the gum line and increased risk of periodontal disease. Genes – Some of us are just more susceptible due to genetic makeup, but you can take precautionary steps. Grinding – Whilst not directly responsible for sensitive gums, if they are inflamed, such can lead to increased disease. The increased pressure that teeth are under can speed up the breakdown of periodontal ligaments. Stress – Weakens the body’s immune system, the natural defence against infection. Misaligned or crowded teeth braces or bridgework – Anything that makes it more difficult to brush or floss your teeth is likely to enhance plaque and tartar formation. Flossing is important here. Hormones – Changes in natural hormone levels, particularly in puberty, pregnant women and those going through the menopause. Medicines – Examples include those for blood pressure or depression can cause dry mouth. A lack of saliva gives more chance for plaque to form. Other medicines may cause the gums to enlarge. This makes them more likely to trap plaque. Diseases – Those with diabetes are more likely to get periodontitis than those without and be more severe if they suffer. Rheumatoid arthritis and HIV infection are just two other diseases known to cause issues with periodontal health. Whilst some of the causes for recession and sensitivity cannot be controlled, others can. The key to cleaning the mouth properly is removing as much plaque buildup as possible. A good routine that brushes away plaque reduces the chances of further buildup and the chances of suffering from periodontal disease and recession. Starting with the basics, you should be brushing twice a day, for at least 2 minutes a time with a toothbrush that is in good condition. Whether that is a manual brush or electric brush, the act of cleaning is most important. You should ensure that as you clean your teeth you do so correctly. Yes, there is a correct way to clean them. Flinging the brush around your mouth in an uncontrolled manner is not the approach. We have created a guide on how to clean your teeth properly. Ideally you should floss daily too, but more on that later. You should then ensure you visit your dentist regularly. It should be every 6 months or at worst annually. Whether you have a fear of the dentist, or the cost is an issue, my experience tells me that generally speaking it will be a more fearful and expensive trip, should you leave it until it is too late to treat a problem you may have. Fix the problem before it gets worse. 1 in 2 Americans (according to the CDC) actually suffer from sensitive or bleeding gums, with many thinking it is normal. Whilst common, it is not normal for your gums to bleed you do not want that. Thankfully it can be relatively easy to manage sensitive gums and within a few days you can see dramatic improvements with the right steps. When at home, the best thing to do is to avoid worrying as much as possible. Stress and worry can make it worse. If you have had sore gums and bleeding for many weeks or months, our advice would be to book a dentist appointment. It need not be an emergency appointment but as soon as possible. Should it be that only more recently your gums have begun bleeding and become inflamed, then addressing your oral hygiene routine would be the first port of call. Make sure you brush at least twice a day for 2 minutes. You may want to brush a third time until the situation improves, but do not let this become habit; brushing twice a day is optimal under normal circumstances. When you brush, make sure you do so properly and with a good fluoride toothpaste. For adults you should be aiming for about 1500ppm fluoride (check the back of your tube). Floss if you can, or use one of our alternative flossers recommended towards the end of this article. Use mouthwash a few times a day to refresh your mouth and wash away excess bacteria. Leave it at least half an hour until after brushing – otherwise you are simply washing away the toothpaste you have put on! A stronger mouthwash like Corsodyl is a good option for a 7 day period. Be aware with chlorhexidine-containing mouthwashes that they react with toothpast, making them less effective, so again do not brush too close to brushing. Use for a maximum of two weeks as side effects include changes to the way you taste, and tooth staining. If after 7-14 days you have not seen significant improvement, then speak to your dentist. Should you ever find yourself in a position that the situation has gotten out of hand or you cannot get on top of it, then don’t fret. Dentists and hygienists have the specialised tools and knowledge to help remove and reduce buildup. Get in touch with them and put yourself back on track for a healthier you. So, this article is about finding the best electric toothbrush for sensitive and receding gums and whilst we have already outlined my best picks at the start, I shall now delve a little deeper and explain why use an electric toothbrush and why the ones I have selected. Now I am not sure about you, but 21% is a big improvement in my eyes. If you have tooth wear or receding gums, an electric toothbrush has a great benefit because a less forceful action is needed. If less force is used on your teeth, there will be less damage to the gums and tooth, protecting them in the future. This is just the effect of brushing with an electric toothbrush, there are many other benefits too. However my personal opinion is that the benefits outweigh the negatives. Price is often the biggest limiting factor, but when options exist for less than £50, can you put such a price on your oral health and well being? Gum disease and inflamed gums can really demoralise us; I know — I have been there. Most of us have at some point. In the moment we often will pay whatever it takes to make things better. 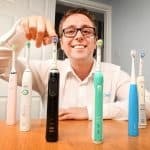 The electric toothbrush is not just about helping resolve your sensitive gums quicker, many are about educating and improving your oral health as a whole. Here are the features I would consider essential when when buying an electric toothbrush for sensitive or receding gums. Normally an additional mode over the standard ‘clean’ or ‘daily clean’ mode, this cleaning mode generally operates the brush motor at a lower speed to reduce the pressure and sensitivity on the gums. It continues to deliver a consistent power and motion unlike a manual brush. This mode has been optimised for situations like yours. Brush heads tend to vary in the firmness of the bristles, with many standard heads being firmer than you might like, or are desirable when you have sensitive teeth and gums. Leading brands cater for this with ‘Sensitive’ brush heads that are included in the box or can be purchased separately. They have much softer bristles to help avoid triggering any additional or unnecessary sensitivity. Philips Sonicare even have a head specifically for Gum Health, perhaps best for when the greatest sensitivity has subsided. The third most important factor in my mind: a pressure sensor that triggers an alert via a LED light or an on-screen notification (model dependent) that you are brushing too hard. The brush motors will automatically adjust as a result of activation, but as one of the leading causes to gum recession such an alert will help educate you to reduce the pressure applied and let the bristles skim the tooth surfaces. Too few people brush for the correct amount of time. Most electric toothbrushes will come with a timer on board. Set normally for two minutes the brush will alert you or even power off automatically in some cases when the time is up. You should not stop brushing until the 2 minutes are up, your gum health relies upon it. Most brushes also include a ‘pacer’ which helps you allocate the appropriate amount of time to the various sections of your mouth for an even clean. The following are not ‘essential’ but you may wish to bear them in mind when making your decision of investing in an electric toothbrush. The studies have shown that these brushes, primarily manufactured by Oral-B, perform best with plaque and gingivitis removal, so there is some advantage. However, the consistent motion offered by an electric toothbrush is a massive step forward and will improve results quicker than if using a manual toothbrush. You might be looking to solve your sensitivity issue right now, but what about if it clears up, what will you do? Could other family members benefit from the electric toothbrush too? All will come with a standard cleaning mode, but whitening or deep cleaning modes might be appealing to others in the same home as you. Premium models exist with an array of clever and useful accessories. From travel cases to brush head storage compartments, if you are going to invest, invest in a brush that meets your needs now and in the future. It is more effective to buy a package now than to add on bits later. Travel for business or pleasure? How will you protect it when on the go. None of the brushes I recommend offer less than a week’s battery life, but some are better than others. If you travel, lack a power outlet in the bathroom or intend to share the brush handle, you might want to look at other options. There are also those that run on AA batteries. To date, I have yet to see or handle a viable electric toothbrush that is powered by removable batteries that would be suitable for anyone with the aforementioned conditions. The most advanced brushes now have Bluetooth connectivity and link to your smartphone or tablet via and app. Through this you can log, monitor and track your cleaning as well as receive helpful updates and share with your dental professional. By no means ‘essential’ you can really keep an accurate log of your journey and some models even know and can advise where you have missed bits when brushing. 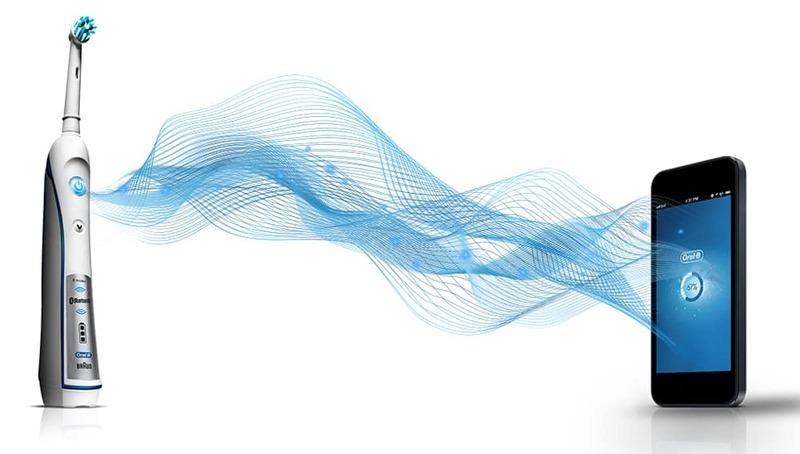 Find out more in our Oral-B Bluetooth connectivity article. Sadly many features do come at a price, the more features the more expensive. That said, there are many great value options available that don’t break the bank, but are more expensive than a manual brush. Pay what you are comfortable with given the features gained. Do remember though the cost of a toothbrush will be a lot less than the dental bill if you don’t take the right steps. These are just some of the things you need to consider. There are more. If you really want to get into all the detail and understand all of the features in more depth; check out our electric toothbrush buyer’s guide. Should you be a bit overwhelmed and not sure where to turn or what to buy, then by all means leave a comment on one of our posts, reach out to us here via our contact page or on our social media accounts, or speak to your dentist. The act of flossing is something most of us are encouraged to complete at least once a day. The reality is few really do. I am not here to judge whether you do or don’t, I just want you to as best as possible manage your sensitive gums. In between teeth in everyone’s mouths are gaps. Some of these gaps are larger or smaller than others and may require different flossing tools. However irrespective of the size, you need to regularly (ideally daily) clean these gaps. You might feel you now have sensitive gums because you have not flossed previously, and the thought of running a thin bit of string between the teeth and along the gumline fills you with dread. I know myself that flossing can be painful, it can cut into the gum. There are different types of floss available including thicker and wider ‘tape’ style flosses. Interdental brushes are the best option to go for, if you have gum disease. They are less likely to hurt the gums due to their design and varying sizes, however they do take time and can work out quite expensive. You can learn all about them in the article Interdental Brushes – All you need to know. There is another option though and that is using a water flosser. As the name implies it relies on using a jet of water to be brushed in between the teeth and along the gumline to dislodge and wash away bacteria. WaterPik are the best known brand in this space and have a diverse range available from portable to countertop options. Spending just a couple of minutes reading our article on the best electric water flossers will give you a lot more insight. There is also the Philips Sonicare AirFloss which works in a similar way, but injects more air and fires the water out at a higher speed. It is much quicker and more convenient in my opinion and is my favourite water flosser. 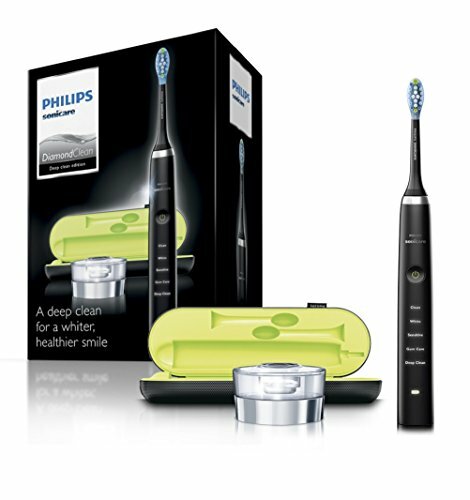 Read our Philips Sonicare AirFloss review. Sensitive teeth and receding gums are not pleasant and I wish for nobody to have to suffer with such. However it is a very real and common problem for dentists to see and treat. If you are suffering you need not worry, there are solutions. We are all unique, no two mouths are identical and what works for one will not always work for another. But depending on the severity, one of the best things you can normally do is invest in a good oral hygiene routine. Daily brushing and flossing, when done correctly, can help to remove most of the plaque from your teeth. Use of an electric toothbrush can enhance this plaque removal but up to 21%. More expensive than the old fashioned manual brush, you may feel electric is not worth it, but what price do you put on your health? The cost of treating gum disease from improper cleaning will cost you a lot more emotionally and in dental fees than any electric toothbrush. Offering more than just a powered brush, electric toothbrushes today help educate and inform you to become better at cleaning; they are like a dental health professional at your side. Gum disease has been dubbed ‘The Silent Killer’ as apart from a few minor symptoms, such as bleeding or receding gums, or bad breath, there may be absolutely no other signs until it is too late. Take the precaution and make sure you are removing the bacteria that fuels this disease. If you have anything you want to say or add about electric toothbrushes for sensitive or receding gums? Used one of these brushes and can speak first hand about how good or bad they are? We welcome any comments, please leave them below. I just researched and bought the xiaomi Mi sonic toothbrush for less than $30. It is a smart toothbrush, with timer and a great app that shows me where in my mouth I am for how long. I really recommend the mi sonic toothbrush. Thanks for the comment. We will be sure to check this brush out soon. How will I notice that the pressure sensor light has come on when the brush handle is right up close to my mouth during brushing? You should notice out of the corner of your eye. That said, many tend to brush in front of a mirror in the bathroom, which of course makes things a lot easier and very obvious. If you are brushing too hard, you should hear the sound of the brush change that is also an alert to you. Great article on sensitive teeth. I was expecting to pay a lot more but after reading will now buy the oral b 3000. Super, glad I could save you some money. Hello Jon, I was prepared to pay far more to replace my brush which is over five years old. However instead of £100 I expect to pay £50 and I shall have a new brush which is suitable for me. Thank you for doing the research for me, so glad I clicked onto your website. Hi Lesley. Glad I could ave you money.